Whats The Difference Between Portable and Truckmount Carpet Cleaning Castle Rock CO.
Hi everyone today I will be explaining the difference between Portable and Truckmount Cleaning Systems for Carpet Cleaning in Castle Rock Co.
Their are three primary elements to carpet cleaning. 1) PSI this stands for pressure per square inch. The purpose is to be able to disperse steam and chemicals in to the carpet fibers at a high rate to insure that the fibers are getting fully saturated. Most commercial portables will operate at 100 to 300 psi. Truckmount machines can operate up to usually 1000 psi. Optimal psi for carpet cleaning is around 500 psi thus making the Truckmount superior in this regard. 2) Heat Most commercial portables will have no heat, some may use bucket heaters which will keep water warm at best. Truckmounts have internal Heat exchangers which will allow the water to be constanly flowing at 200 degress plus. This makes the truckmount clearly more superior. 3) Blower Vac. Others words the machines abilty to extract solutions, water, soil and so on from the carpet. Most commercial portables have two stage vacs. Some will have three stage vacs. these will work ok with very short hose. Truckmounts blowers are 10 times as powerfull making not only the extraction more effecient but also the lift. This well may be the biggest difference you will find out of all three. Conclusion is simple. A Truckmount cleaning system will out preform a portable any day of the week. As a result you will get a bettter over all cleaning with a truckmount system. I hope this has been informative for you. 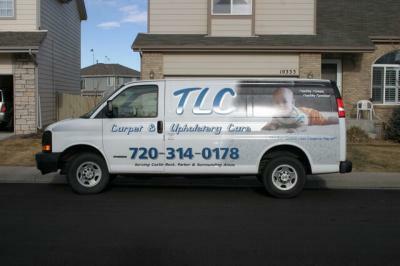 TLC Carper Care proudly serves Castle Rock, Parker, Franktown, Elixzabeth, Kiowa, Sedalia, Larkspur, Lone Tree, Highlands Ranch, and Centennial Co.